Our medium sized greenhouse is a great size for the ambitious gardener, who needs a little bit more growing space than our small model provides. This model greenhouse comes with an Anderson storm door, rear window, and two automatic overhead vents to whisk out excess hot air during the warmer months. The medium model accommodates a maximum of four (4) of our optional cedar work benches. Solar Gem Greenhouses require no assembly. 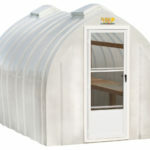 The one-piece fiberglass greenhouse construction, Gothic-arch and ribbed design make our greenhouses super strong and yet remarkably light weight. These portable greenhouses are easy to move from one location to another. They have no seams for heat loss and no framework to rust, rot or panels to get loose from gusty winds and storms. The Easiest Way To Garden! Our ceiling vents and automatic ceiling vent openers are located at the top of the greenhouse preventing heat from getting trapped which allows for natural heat exhaust and eliminates the need for expensive fans. Shade cloths are not required because the greenhouses are not clear. The glass fibers in the wall diffuse the light inside the greenhouse resulting in uniformly shaped plants and flowers, eliminates the need for turning or rotating of your plants, and allows for multiple level gardening. 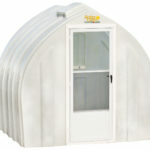 The Solar Gem Greenhouses will out produce any comparable size greenhouse on the market. 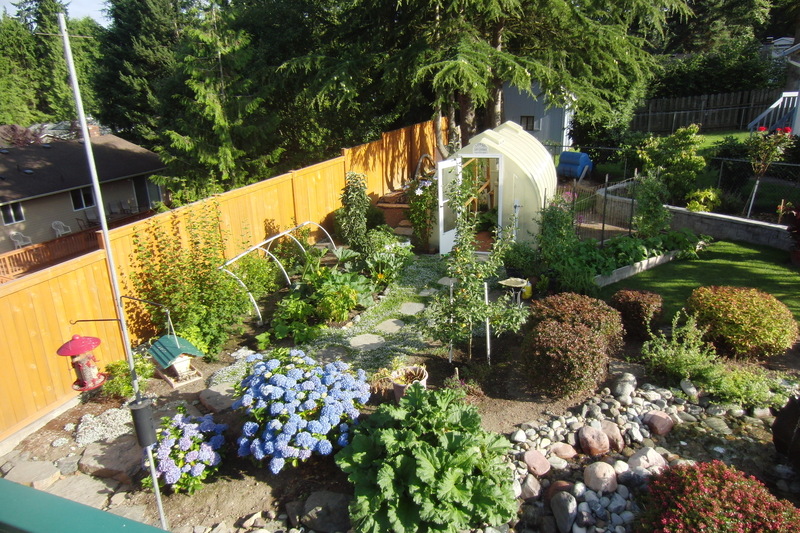 Our Small greenhouse, the 8’ X 7 ½’, easily starts enough plants for a garden over 3000 square feet. All you need to do is dig a 3 inch deep, 10 inch wide trench for the greenhouse to fit into and we do the rest. Our delivery crew will place the greenhouse into your yard right where you want it, for local deliveries only. Once the built-in foundation lip is back filled with dirt or gravel the greenhouse is secure. You then have natural drainage inside the greenhouse and you can plant directly into the ground if you want to. The 8’ high ceiling is plenty high for tomato plants, lemon trees or most any tall plant. Even our smallest greenhouse is 8 feet tall, so you are not limited to the type of plant you choose to grow. Some customers will anchor through the built-in foundation lip to secure the greenhouse to the ground, an existing concrete slab or wood deck by using spikes, rebar, concrete anchor bolts or lag screws. 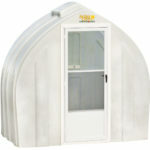 The Solar Gem Greenhouse is the only fiberglass greenhouse with a gel coat exterior. We use the highest quality marine grade gel coat on our greenhouses. The resin we use is formulated exclusively for us to our specifications. Both the fiberglass interior and gel coat exterior are UV stabilized. 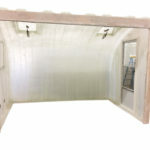 So, unlike all other fiberglass greenhouses and fiberglass panels on the market, the Solar Gem Greenhouses will not pit or get rough on the outside. They will not become a dirt trap! Our gel coat stays smooth for as long as you own the greenhouse and it does not discolor. Simply hose it off if it gets dusty or dirty. Your Solar Gem Greenhouse will always look new. We are the easiest greenhouse to maintain! We have designed and produce cedar work tables, potting trays and watering trays for all of our greenhouses. Our work tables come with hang rails and are available as single or double shelves. They come with removable slats and our extra large potting tray and watering tray fit right into the table. The removable slats allow you to plant into the ground. You can let your tomato plant grow right up through the table and still use the rest of it for potted plants. 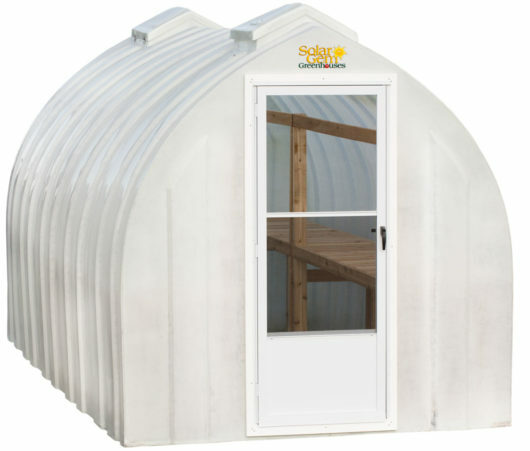 The Solar Gem Greenhouse is truly the easiest greenhouse to garden in all year long. We strive to make you a happy and successful gardener. Check out our calendar page to see if we are at a show or fair near you. Click on a date to see show locations and show times. Be sure to visit our “Find a Dealer” tab to see if we have a dealer near you. Or, if you are in the Seattle/Tacoma area, stop by the factory and see them being produced. We usually have all sizes in inventory.